It is finally getting close to the end of summer, and we are hanging out having fun creating some awesome Gulf Shores photos. Late summer at the beach is one of my favorite times of the year. With fewer crowds and still tropical weather, our session last night played out perfectly. Well, we did have trouble with one photo bomber, but our senior said it was okay for a few shots. This time of year, the sun starts setting earlier and earlier, and I am personally a big fan. The sweat light seems ever so sweater, and the cooler temps make the sessions a breeze. Last night was a perfect example of a perfect session. Needless to say, our subject rocked the session, and her yearbook shots will defiantly speak louder than her peers! If your senior is looking for senior portraits that stand above the crowd, look no further. 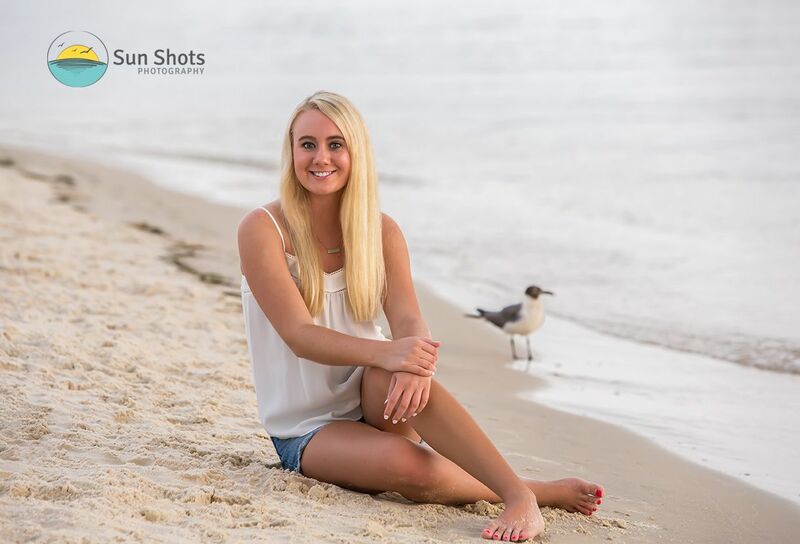 We would love to speak with you about your very own senior beach portrait session. Summer is the best time of year, and we do have a few slots remaining. We take great pride in every single senior session we take on and promise to deliver shots that will represent exactly what your senior is looking for. We understand the importance of how special senior portraits are, and will go to great lengths to deliver. Please reach out to us to discover what a difference a session with us can make. Hurry before winter is upon us, the beach is still open, so come on down. You have another four-month window before the Snowbirds bring the cold air. You can reach us anytime at www.sun-shots.com or via phone at (251) 968-2119. Either Maggie or Ryan will love to fill you in on all the details. We even know of a few beach rentals that are greatly discounted this time of year.